Compared to how much I wanted to spend on holiday season gifts, I would say that I did a good job at holding back on trying to collect everything. Holiday specials can sometimes be a hit or miss for me. I've heard and purchased some holiday kits that were subpar and usually not as good as the full sized permanent range. So far, I'm pretty happy with what I chose! Keep reading to see what I got along with some mini reviews. 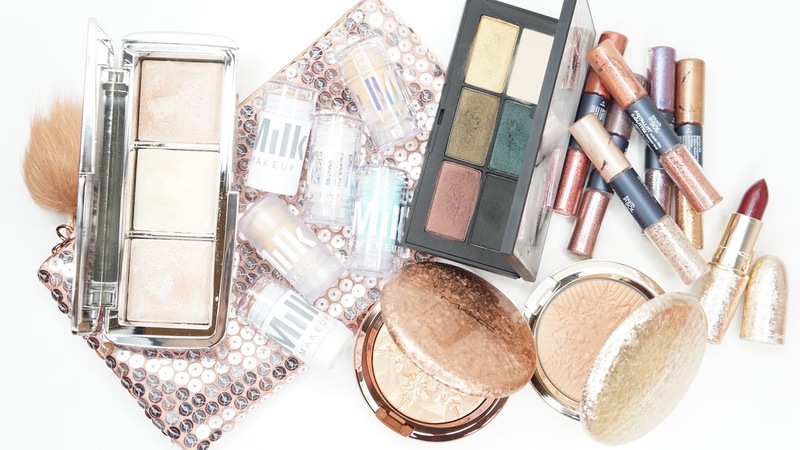 Milk Makeup A Team Minis | This set of minis was a perfect intro for me into Milk Makeup and it includes the Matte Bronzer in Baked, Blur Stick, Highlighter in Lit, Glitter Stick in Techno, Cooling Water, and Mars Holographic Stick. I've tried a sample of the Blur Stick and the full sized version of Techno. The mini version of Techno in this set is actually going to included in a future giveaway! When I use Techno, I have to use my fingers to apply it since the full sized tube is way too large to swipe onto my face. I can see the Cooling Stick and Blur Stick working well as the full sized version, but the mini versions of everything else work so much better since there's more control. I like everything so far, but the Cooling Water and Blur Stick really stuck out to me. My eyes often feel dry and meh in the morning and so I like running the Cooling Water under my eyes to pep them up a bit. The Blur Stick doesn't do wonders for me, but I like how it smoothes out my acne marks . I'm not really feeling Mars, but it's mostly because of the color. The pink / peach shift seems like something I would enjoy, but the pink shift looks neon on me and it doesn't look flattering. The bronzer has some slip and is pretty close to my skin tone and so I could easily pass on that. I'm thinking I would mostly use the bronzer to help alter slightly too light foundations to help warm up my complexion. Oddly enough, I do really like Techno considering there are noticeable pieces of glitter in it. I sometimes use it directly on my eyes as well when I want something quick that's still interesting. Touch In Sol Metallist Liquid Foil & Glitter Double-Ended Eye Set | I've been wanting to try these for awhile and so when I saw this set pop up during the Sephora sale, I had to get it. I'm never going to be able to finish a full sized eye product and so these minis are perfect! There's a metallic liquid eyeshadow on one end and semi loose glitter on the other. The glitter is easy but also hard to use since it sometimes flies everywhere when I remove the applicator from the tube. These aren't my favorite liquid shadows and glitters to use, but I do enjoy using them because of how metallic they look. NARS Cosmetics x Man Ray Glass Tears Eyeshadow Palette | My full review of this palette is here, but the short version of it is - this palette is amazing! For a small palette, all of the shades are complete hits and my only very minor complaint is that there isn't a crease/transition shade but everyone has a million matte mid tone brown shades in their collection that they could pull from. The jewel tones are perfect for the holiday / winter season as well. Hourglass Ambient Metallic Strobe Lighting Palette | I haven't really been intrigued by Hourglass Palettes before since they tend to be on the expensive and tiny side, but this palette really took my breathe away! With every review and swatch I saw of this palette, the more I wanted it. I'm also very glad to say that I adore it! The regular Strobe powders looked like it had a lot of glitter to me, but these Metallic Strobing powders looked more smooth while being metallic once you build it up. I really like the pink and champagne/golden shades mixed together and used separately, but I'm kind of meh about the more bronzed shade (Lucent Strobe Light). I like using the bronzed side with bronzer, but I'm more about only highlighting now. MAC Cosmetics Face Powder in Here Comes Joy, Extra Dimension Skinfinish in Whisper of Gilt, and Lipstick in Elle Belle | Honestly, I'm not too wowed with MAC's holiday collection. A huge part of me probably just got these items because of the packaging. Yes, the powders are pretty but they don't seem to melt or blend into my skin like other highlighters I have. While Elle Belle is a very pretty color, it's just another dark plummy red. I'm not trying to downplay the quality of these products, but they're not exactly amazing enough compared to what I already have. Did you pick up any holiday goods? What's your favorite holiday purchase from this year? Last Minute Last Day Purchases!